(2001) Compiled by Janang Ensiring and Robert Menua Saleh. Published by The Tun Jugah Foundation. 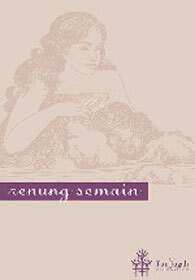 Paperback, 161 p.
Written in classical language of the Iban. It contains a full text of a song of romance, which is widely recited in Betong Division of Sarawak. The song is sung by a professional singer. It describes the intimacy between a pair of long-house youngsters who are in love. It speaks of their fulfilments and frustrations, their successes and failures, their triumphs and tribulations. But more importantly, the book attempts to inform readers about the various social courting etiquettes the young lovers have to adhere to in order to maintain their own integrity and that of their families. In order to know these etiquettes and other social norms governing passionate courtships in the Iban traditional community, readers will need this book to refer to.